Cryptopay FAQ: how to buy bitcoins? what is crypto card? etc - What is a referral program? All Categories › Getting Started › What is a referral program? 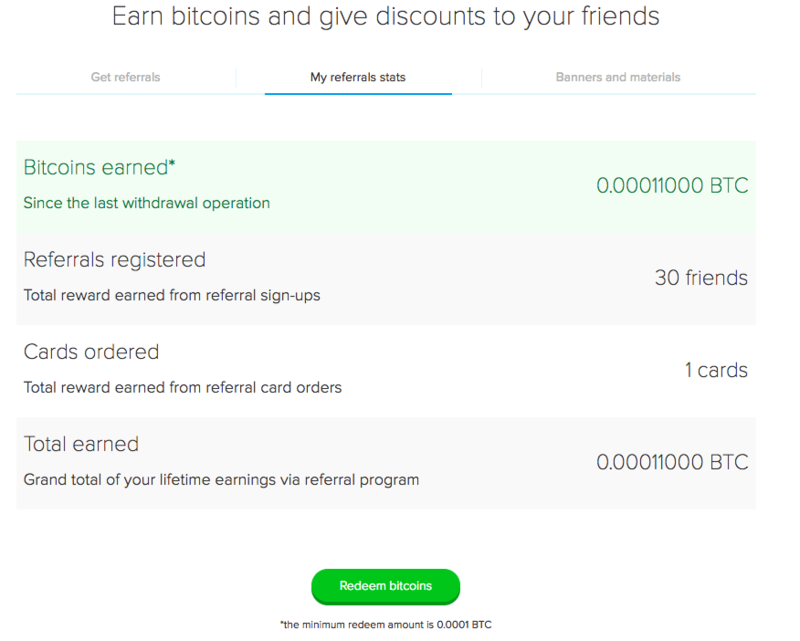 You can actually earn Bitcoins by inviting your friends to use Cryptopay. Your friend will get a 25% discount on their first card order, while you will get 10% of the revenue from all the fees Cryptopay charges. To find your personal invitation link, just click on your name in the upper right corner and you will see Referrals. Just click on Copy link and send it to someone you'd like to share it with. You can also post your invitation on Facebook or Twitter in just one click, or advertise Cryptopay on your website. On the last tab, you'll find banners and related material. To invite someone via email, type the address of the person you'd like to invite and press "Send invites". You can send a batch of invitations by adding multiple addresses. After your friend clicks on the link, they will be redirected to the Cryptopay sign up form. To check how many friends have used your link as well as the amount of revenue you've earned, go to "My referrals stats" tab. Please note: the first revenue is earned when your affiliate makes their first transaction that is charged a fee. Sending and receiving BTC is free of charge. To send earned BTC to your Cryptopay wallet, click the Redeem bitcoins button. The upper counter, which keeps track of BTC you have earned since the last withdrawal, is reset after redeeming bitcoins. The lifetime amount of bitcoins earned can be found lower.